It must have been in August or September 1952 that Clive Clairmonte's patience finally ran out, and he collected the frame, with front suspension, engine and the Halibrand final drive unit fitted and took them off to the factory he ran with his brother. His Riley engine had blown up [possibly in his last race at Silverstone on 12th July], and he decided that what he really wanted was a sports car to race in the 1,500cc class. From now on Sorrento was going to be very busy! 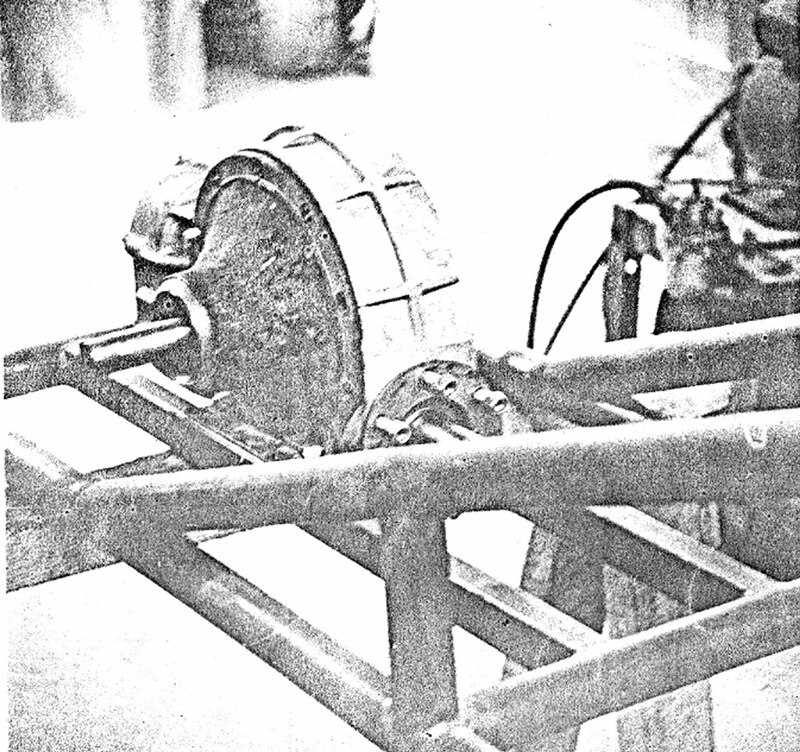 The chassis frame in the Hornsey works with the Halibrand Final Drive unit in position. This is the only photograph taken in the Lotus works. It shows the rear end of the frame with the Halibrand final drive unit in place. You will have to rely on my memory to accept that the front suspension was fitted, but I cannot remember if it had any brake drums. John Teychenne is very vague as to what happened next, and even Dave Kelsey, whose memory is usually pretty good, cannot remember if they did any work on it for Clive. He and Johnny had by then started to make the Mark VI chassis for Colin in their spare time, and this would not have left any time to help someone else, however much they might have been inclined to. So Clive decided that he wanted the chassis widened into a two seater, with a four cylinder Lea-Francis engine of 1496cc capacity. The upper lengthwise frame member was cut at the dashboard, and the lower one left in place. Wider upper and lower tubes were added, angled on to the original tubes beside the engine. This alteration may be clearly seen in the photos. It is reasonable to assume that Colin Chapman would have let Clive have the drawings he had done for the rear end, the rear suspension, de Dion tube and hub carriers because those made are very similar to the layout used on Colin's next car. the aerodynamic Lotus Mark VIII, although in the latter case the springs were entirely different. He would probably have bought the rear spring/damper units at the same time as the front ones, and passed these on as well. The rear of the frame was widened to accept the coilspring/damper units in a more upright position, and this made it quite difficult to thread the radius arms past the wheels to their position on the outer hub carriers. 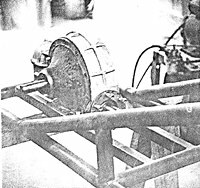 The de Dion tube was made in three parts instead of being bent (as Colin had probably intended) and sideways movement was controlled by a block sliding in a channel at the rear of the tube. The Mk VIII used the same system, but mounted at the FRONT of the tube, which is a more elegant solution which I think Colin would have preferred. for the Mk VII, although this might have made access to the quick change gears on the Halibrand axle more difficult. Michael Allen remembers selecting the outer rear half shafts from a catalogue of current British Production Car parts, and visiting H A Saunders to measure the shafts finally chosen which were from the Austin A90 Atlantic. Alfin drums were bought for the front brakes, and five stud Dunlop wire wheels. These would not fit onto the front Alfin drums until each had been meticulously filed to allow the spokes to clear the fins on the drums. According to Len Pritchard, the surviving partner of the famous coachbuilders Williams & Pritchard, the car was then brought round to them for the shapely body to be created. In the Spring of 1953 the car was finally ready for the road. It was painted black, and as it no longer looked anything like the car that he had first ordered, Clive decided to call it the Clairmonte Special. He registered it with the number YMV999 on 1st May 1953 and entered it for its first race on 27th June 1953. 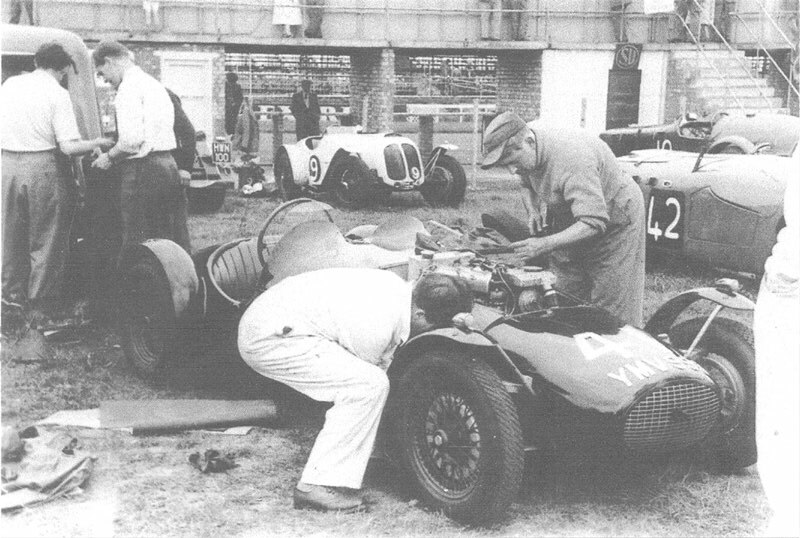 This picture shows the car being worked on in the paddock at its first race at Silverstone as No 41. The Alfin drums and spoked wheels can be clearly seen. The mechanic on the far side of the car is Fred "Sorrento" Boon. Dave Kelsey recalls: "The first I knew it was even running was when John T turned up at my house one morning. It was finished in glossy black and made a most impressive noise when John and I gave it its first blast up Muswell Hill at a considerable rate of knots, collecting a speeding ticket en route. Half way up the hill, Freddie Boon popped up - he lived in a side turning off the hill. At its first race at Silverstone, John and I watched from the pit counter. The flag fell, Clive dropped the clutch, and the rear wheel preceded him up the straight, arriving at Copse only slightly behind the other cars. Clive parked it, got out, walked back to the pits where we waited, pulled out a batch of girlie photos from his pocket, and said 'what do you think of these, lads?. He made no mention of the vagrant wheel, and nor did we." Its first race was at the MMEC [Midland Motor Enthusiasts Club] meeting running as No. 41. They must have fixed the wheel because it later came 2nd to Peter Gammon's MG in the up to 1500 cc Sports Car race. The outing was followed by races at Snetterton (11th July, 1st August and 12th September) and Silverstone (14th August and 10th October) resulting in 3 First's, 2 Second's and 1 Fourth, 1 Sixth and 1 Seventh. This performance was highlighted in Autosport 26th February 1954 where the Club Racing Survey called it 'one of the most successful home built cars' [Chapman must have been pleased! ].